"Without the Lord, All is Vain" is the motto on the emblem of the Reformed Church in America (RCA). Following the Reformation in Europe, immigrants from the Netherlands established the first organized Protestant denomination in the United States in 1628. Pella Reformed Church, a member of the RCA, shares in this rich and long history. The village of Pella, established around 1884, was the home to a store, post office, broom factory, and blacksmith shop. The land was purchased by a man named Ford Lewis through the Agricultural Endowment Act of 1863 for $1.25 per acre. In 1869, a man named Robert D. Tout purchased the land across the road. 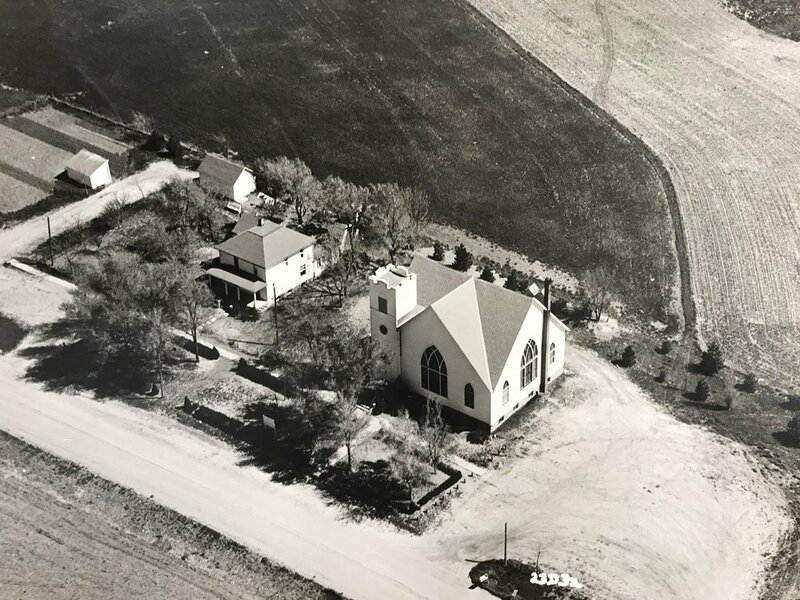 As people from the Netherlands homesteaded in the area, a need grew for a church closer to their homes. The long ride in buggies and wagons to the village of Holland, a distance of nine miles, was very difficult in the winter months. In 1883, a meeting was held in which two elders from Holland and nine families gathered. Mr. G. Hauk, the new owner of the store, offered his business as a meeting place. The heads of each family would take turns reading sermons. As the attendance grew, the store became too small. Ford Lewis donated the land on the south side of the road for a church, and a 24'x32' building was constructed in the spring of 1884. It had only bare rafters and no floor. On August 11, 1884, the Pella Reformed Church was organized, making the church 125 years old in August 2009. Pella means "city of refuge". Our first pastor arrived on November 1, 1886. A second building was built and used from 1886 to 1915. Pews were installed in 1892, and a horse barn was built in 1906. Land was purchased for a cemetary in 1889. Since English was becoming the first language, afternoon services were started in 1890. The morning Dutch services continued until 1943. A third church with a basement was built in 1915 and was used until 1974. The taking of collection changed from using bags to offering plates in 1922. The road by the church was graveled in 1928 and a delco light plant installled in 1929. In 1944, it became necessary to remove the church spire. The first electric organ was purchased in 1947. It was replace by a new organ in 1974. A new parsonage was built in 1959 and updated in 2009. The current church was built in 1974. The bell tower and cross were built in 1981, followed by the ball field in 1983. An education addition was added to the church in 1987, and chimes were added in 2007. The Pella Christian Preschool was active from 1998 through 2014. Pella Reformed Church has held anniversary celebrations for the 70th, 100th and 125th years. The present pastor, Rev. T.J. South, is the 23rd minister for the congregation.